It’s almost autumn! Cooler weather brings relief to West Texas after a long hot summer. 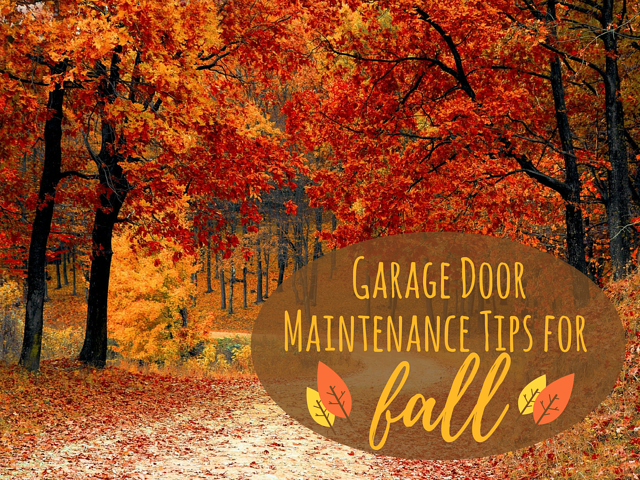 However, it’s critical that you conduct these quick garage door maintenance tips for fall - they can help you avoid serious issues that could put a damper on your autumn weekends. Hot summer air dries out more than just the ground. If you notice your garage door isn’t opening and closing as smoothly as you would like, consider apply lubricant to the moving parts. Though grease can last a long time, it’s always good to run a quick check to confirm. Additionally, make sure there’s no lubricant where there shouldn’t be. Fall cleanings can be just as cathartic as spring cleanings! Over time, the rubber or plastic weatherstripping along the bottom of your garage can rot away. Fall is the perfect time of year to replace it, because who wants water, dust, or autumn leaves in their garage? Additionally, it helps to regulate the temperature in your garage. Place a standard contractor’s level on your door when it is in the “up” position. If the bubble doesn’t balance, it means that your door is off-kilter. When your garage door is unbalanced, you increase the risk of it falling off the track. It also causes more wear and tear on your door than is necessary. Though you can conduct a significant amount of this maintenance yourself, have a professional conduct a seasonal check before cooler months begin. Weather can alter your door’s performance, especially if something is already a little off. Contact the professionals at Overhead Door to set up your appointment. We don’t just offer new door sales and emergency repairs – our preventative services can help save you time and headache.